PIP is supposed to offset some of the extra costs of a disability. 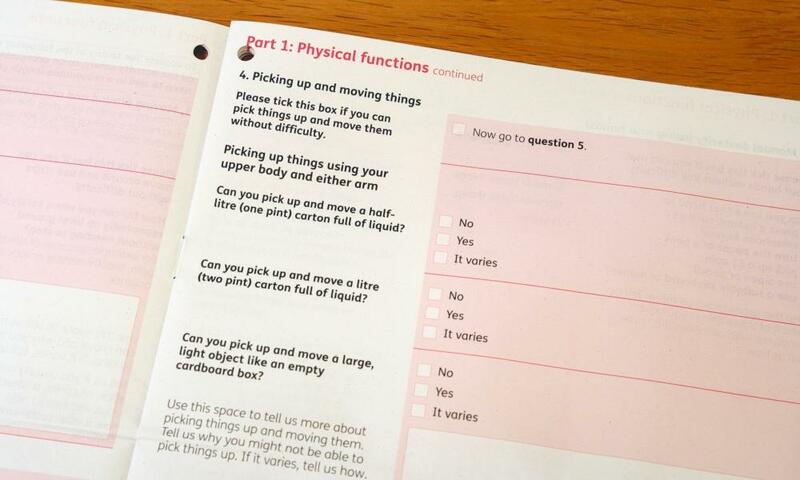 Applicants are evaluated by health workers from the private firms Atos or Capita, who forward their assessments to a DWP decision-maker – who scores you on “daily living” and “mobility” (you need at least eight points for each to qualify). Currently nearly 3 million people claim some element of PIP, and my wife expected to be one of them. As did her benefits adviser, an NHS psychiatrist and a psychologist. So, armed with a dossier of supporting medical documentation, Bea applied. That was last November. I’ve seen glaciers move faster. The thing about accompanying someone to a PIP assessment when you have your own disability is that you’re in danger of stealing their thunder. I have cystic fibrosis, I’m undergoing a lung transplant assessment, and I’m on oxygen 24/7. Bea has a hidden disease and most people aren’t trained to recognise the signs of her inner turmoil. Which means the receptionist is staring expectantly at me, oxygen cylinder strapped to my back, rather than my wife as we approach. The good news about my wife’s assessor is that she didn’t ask Bea why her suicide attempts hadn’t been successful – a tactic that, shockingly, several applicants have claimed their own interviewers used. The bad news was that she displayed a frostiness to put the Snow Queen to shame. Bea’s acute distress during questioning – her body rigid, lips trembling, eyes welling up – was coldly met with impatience and irritation. Imagine admitting to a series of deeply embarrassing difficulties that you battle with on a daily basis. How, for example, venturing outside on to a bustling high street feels akin to an artillery bombardment, a barrage to your senses. Or how, on some days, your body feels so leaden and heavy you can’t even raise yourself to sit up in bed. You’d hope that they would take those difficulties seriously. The biggest shock for Bea wasn’t that her overall PIP application was rejected, but rather the manner of that rejection: being told that her claim had been unsuccessful because, in the assessor’s opinion, she was functioning perfectly normally at the assessment – thus scoring zero points, with the pages of supporting medical evidence overlooked. This letter struck to the very core of Bea’s difficulties. “I’ve been rejected,” she said flatly. First came disbelief, then anger, and finally a tsunami of shame. She stumbled to the bathroom and locked herself in. She went catatonic, lying on the bathroom floor in a stupor, occasionally jerking back to reality with ragged gasps of panic. Perhaps if they had read these medical notes they might have seen how, along with a severe and complex anxiety disorder, my wife’s mental health diagnosis features a particular vulnerability towards “rejection” and “abandonment”. But in their dash to get through her case and on to the next, they did not see it – or even worse, they ignored it. There’s nothing quite like witnessing your wife tumble through a gaping chasm, to see that there’s something rotten at the heart of a welfare assessment system. From what we experienced, the wrong people are doing the wrong assessments with the wrong tools, using incorrect assumptions. And it left me reeling: how could this happen to my wife? I discovered that her experience is just the calamitous tip of a PIP-denying iceberg.While the DWP claims it doesn’t operate quotas to save money, figures released in April, covering just six months of 2016, showed an enormous expansion in claimants receiving zero points, up to 83,000. That’s only 10,000 fewer than in the previous 12 months. And it gets worse. New PIP guidelines were added this year, whereby mental health claimants whose mobility is limited due to “psychological distress” are now in effect barred from gaining the mobility component. “We want to make sure we get the money to the really disabled people who need it,” George Freeman, the director of Theresa May’s policy unit, said on the subject of anxiety on BBC radio in February. Bea may not be on oxygen 24/7, as I am, but her condition – and her symptoms of acute psychological distress – can be just as disabling. Acute anxiety that leads to dissociation is a physiological response: your body shuts down. Many MPs have concerns too: the Tory MP Peter Bone declared in a Commons debate in February that “I am fed up with seeing [constituents] who clearly should have been awarded PIP.” Bea’s outraged welfare rights adviser recalled a previous PIP rejection by letter of another client, when it was crudely stated that as the individual wasn’t rocking backwards and forwards during the assessment, there was clearly nothing wrong. After Bea’s discharge, I found myself constantly checking on her, terrified she had taken another overdose. But one weekend when I was away, visiting my sister, it happened again. A close friend came to her aid. There’s no time for fighting the benefits system when your wife is in a psychiatric unit. When Bea was finally home once again, and felt ready, we slogged through the DWP’s internal “mandatory reconsideration” appeal stage, with help from her adviser. Here the rejection rate is 80%. Bone himself has called these reviews a complete waste of time. After several months Bea’s appeal was looked at, and rejected out of hand. I want to thank the decision-maker who saw fit to nudge her up from a derisory zero points to an even more offensive one point. At this point it might be stating the obvious that there seems to be a PIP agenda against people with mental health difficulties, and it’s harming the most vulnerable. The government may be trumpeting how mental health needs to be invested in, but its core approach is fatally flawed. Why, for instance, is there no consideration for how anxiety disorders can be just as crippling for mobility as those requiring a walking stick? I’ve asked Bea what she thinks. She tells me about the other people she’s met at the crisis house. How most of them are repeat visitors with an array of serious mental health conditions, and many can’t work. They’re considered ill enough by the local authorities and A&E to require supported living, but too well by the DWP to be in receipt of PIP. She believes a lot of things could make a difference. Better-trained PIP staff would help: Bea’s assessor didn’t believe her claims, as she didn’t understand Bea’s condition. And changing some of the underlying DWP guidelines about mental illness would make a big difference, such as rolling back the recent PIP changes on mental health and the mobility component. And of course, writing to your MP with your own experiences and difficulties: Bea had written to hers, on another government benefit called ESA, and they intervened. Our PIP complaint letter is up next. She also wanted me to write this article, despite the unwelcome attention it might bring her. I think she is very courageous. There is another thing claimants can do: persevere. Some time after Bea’s second emphatic DWP rejection, we filed a motion to go to tribunal. Tribunals are independently assessed. They carefully read through the supporting medical notes, and they don’t have political agendas: most people who go on to appeal here win. The DWP doesn’t like to be made to look like an idiot so, lo and behold, with the full weight of a tribunal imminent, they finally had a thorough look through Bea’s case. I spoke to a DWP official on the phone who finally acknowledged my wife’s difficulties and offered an avalanche of points and an award of the daily-living component if we withdrew the appeal. I expressed my frustration at an utterly broken process. But at last Bea had her offer of PIP. That’s the difference perseverance can make. The true measure of any civilised society is in how compassionately it treats its most vulnerable members. Judged by how PIP claimants such as Bea are being treated, ours is failing.